When you are considering buying an indoor humidity monitor, several factors come into play. Where do you live, and how many aspects do you want the sensor to display. In this article, we’ll be trying to demystify some of these questions as we look into the best indoor humidity monitors on the market 2019. What is the Best Indoor Humidity Monitor in April, 2019? AcuRite 00326 Humidity and Temperature 20%-95%- Humidity 32-122 degrees F (0-50 degrees Celsius) +/-3% for humidity and +/-2 degrees F One AA Alkaline Battery Check our Review! AcuRite 00613 Humidity and Temperature 16%-98%- Humidity 32-122 degrees F (0-50 degrees Celsius) Temperature +/-3% for humidity and +/-2 degrees F One AA Alkaline Battery Check our Review! ThermoPro TP50 Humidity and Temperature 10%-99%- Humidity 58-158 degrees F (14-70 degrees Celsius) +/-2-3% for humidity and +/-1 degrees F One AAA battery Check our Review! Adoric Life Humidity, Temperature, and Time 20%-95%- Humidity 32-122 degrees F +/-1% for humidity and +/-1 degrees F Two AAA batteries Check our Review! Ambient Weather WS-2063-W Humidity and Temperature 1%-99%- Humidity 32-113 degrees F (Indoor Temperature) -4 to 140 F (Outdoor Temperature) +/-1% for humidity and +/-1 degrees F Two AA batteries Check our Review! When you don’t know about the levels of humidity in your home, you may find an uncontrolled growth of mold and mites that may affect furniture and walls. With the right humidity monitor, it just becomes a matter of pairing the device with a dehumidifier or a humidifier. The AcuRite 00326 model is one of the most popular models mostly because it does not need any wiring to get it working. The AcuRite 00326 allows for knowing both the humidity and current temperatures. It makes it easy for you to make adjustments to the various instruments that help to bring back the optimal conditions. The humidity level icon is easy to read. It displays current humidity and temperature data which is as easy to know as just taking a glance at the LCD screen. This device also displays the high and low readings for the temperature alongside those of the humidity in 24 hours. The humidity range is from 20%-95% with an accuracy level of +/-3% of relative humidity between 20% and 80%. For the temperature, you will have readings in the range of 32-1220 Fahrenheit. You can also opt for Celsius readings in the range 0-50 degrees with an accuracy of +/-20F. With a device that is only 3 inches high and weighing only 2 ounces, you can place it just about anywhere without it being too obtrusive to your desk or the wall where you install it. You get to choose from three colors more so for those keen on detail and need the device to match with your décor. You’ll love that this gadget has a construction of durable plastic. It may take a few falls without the unit falling apart and malfunctioning. It’s always good to place the device in a secure place like an office desk. Speaking of proper placement, this device comes with a magnet backing which allows installing the unit on a metallic wall or surface like that of your fridge door. This device operates using AA batteries which starts to measure the humidity and temperature in hours. It does not have any beeping sound or any sound so you can place it even in a baby’s room. When you have the correct indoor humidity, you can steer clear of sinusitis, dry hair, or damp, moldy walls. 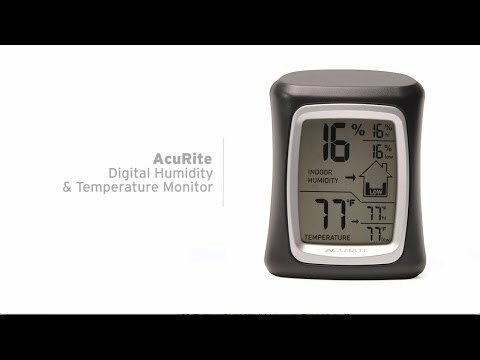 The AcuRite 00613 model is a popular brand which produces some of the highest quality indoor devices for weather and temperature measurements. This particular model uses one AA battery (not included). It will not need any wiring, and the display is quite large on a digital monitor. This digital device is calibrated at the factory. It starts to collect data using its sensors as soon as you input the battery. The large LCD screen displays information about the current humidity and temperature, and you will know this by just glancing on the monitor since the black numerals are large and readable from a distance. You’ll be able to get readings in both Celsius and Fahrenheit. The high and low readings are displayed within a time span of 24 hours or up to 36 hours. With this unit, data for relative humidity ranges from 16%-98% with an accuracy level of +/-3% from 21%-80% RH. The temperature range is just like in the 00326 model at 32-122 degrees Fahrenheit (0-50 degrees Celsius) with high precision of +/-20 F.
This unit takes readings every 15 seconds so you’ll be able to monitor crucial components like your weed room or the baby’s room. The foldout design means you can place the device wherever you need it. It even has a magnetized back to use with metallic surfaces like a window frame. You have three color choices from silver/black, white, and an all black monitor. It shows changes to recent conditions, and you can adjust them accordingly on a humidifier or dehumidifier. With the varied mounting options, high accuracy, and reliable humidity and temperature sensors, this device is a must-have in any home where extreme humidity levels can affect the comfort of your family. The ThermoPro TP50 boasts a simple design for a device intended to keep your family’s living conditions optimal. You have a white digital monitor that can measure both temperature and humidity with high accuracy. It has convenient features which make everyday data records comparable to those of the past. TP50 has many uses as you’ll see shortly. With an accuracy level of +/-3% relative humidity and +/-10F, the ThermoPro model is set to help you make critical changes to your daily living environment. It helps to monitor and improve indoor air quality by providing the means to record humidity and temperature every 24 hours. This allows you to compare recent and past readings which help in making ideal conclusions about any future expectations. Using its highly sensitive sensor, this unit can display the comfort level of your home. The humidity level icon will display dry conditions when the humidity below 30%. The humidity range for this monitor is from 10% to 99% while the temperature range is from 58 to 158 degrees Fahrenheit (14- 70 degrees Celsius). The ThermoPro TP50 has convenient and flexible mounting options. One, the device has a kickstand which allows setting the unit in an upright position on top of a desk. The kickstand allows putting the unit at an easy-to-read angle. You’ll also like the magnet on the back which allows placing of the gadget against a metallic surface. This monitor comes with a single button at the back. It allows making changes from Fahrenheit to Celsius and vice versa just by pressing and holding it for two seconds. You can move this device from location to location. It is a small size that you can hold with only one hand. It is excellent for checking humidity in a baby’s room, or your music instruments room. Did you know that high humidity causes pegs on a guitar to tighten while low moisture causes them to shrink making it hard to tune the instruments in both humidity extremities? That’s where a device like the TP50 comes in. If you are looking for a sophisticated model that displays not only humidity and temperature but also clock and timer settings, then you have it in the Adoric Life. It is a small unit with a 2.7-inch screen which can display all the data you need. This unit features a highly sensitive sensor which is designed to monitor the moisture state of your indoor space. The Adoric Life model can accurately access the humidity and temperature and display the data on the screen. It can also combine the two metrics to help identify the comfort levels displays as Dry, Comfort, or Wet. A 40% RH reads Dry while between 40% and 74% within a temperature of 71.8-82.4 degrees Fahrenheit, the monitor indicates Comfort levels of your home. A wet environment is displayed by a reading that is above 75%. When it comes to accuracy levels, the unit is precise to +/-1% with a humidity range from 20% to 95%. The temperature range for the unit is 32-122 degrees Fahrenheit. Temperature readings can also be in Celsius mode. It is, therefore, suitable for knowing and monitoring the effectiveness of indoor air conditioning systems. Adoric Life wants you to get the most out of their device. The unit comes with a simple touchscreen which allows setting of the mode and functions. You can set the clock to a 24-hour or 12-hour system. The alarm comes in handy to display readings around the time you want it to, like if you’ll be using the unit for your warehouse. The alarm also has the option of snoozing instead of making repetitive settings. This gadget uses two AAA batteries. You’ll have the first set of trial batteries delivered in the unit. The Adoric Life Indoor Humidity Monitor has two magnets. You’ll be able to install it on the kitchen fridge door where it can serve as the kitchen clock. The device also has a stand which gives it enough support when using it on a desk. Two strong magnets and a kick-stand offer stable mounting of the device. Perhaps the most notable feature on the Ambient Weather WS-2063-W is the orange backlight. It is a model that is especially useful for night use or in dark environments. It supports both temperature and humidity readings. You’ll be able to use it in a wide variety of applications from greenhouses, the wine cellar, a camping tent, and many others. This monitor displays readings for humidity and temperature. It indicates the highs and lows for every 24 hours which can also be reset as many times as you’d like. It makes it easy for use at home or business setting where humidity levels can affect the quality of service or health of your family members. This device has indoor humidity range from 1%-99% with a resolution of 1 and accuracy of +/-5%. Indoor temperature range stands at 32 to 1130 F with an accuracy of +/-20 F.
Ambient Weather also comes with an outdoor temperature probe of the range -4 to 1400 F. It is a useful feature when you need to know water, freezer, or refrigerator temperatures. The probe is entirely waterproofed, so it remains unaffected by moist conditions. The display showcases large, black numerals that are easy to read from a distance. It can be read even in the dark thanks to the automatic backlight which can also be activated by a manual button at the back of the device. The acrylic face comes with a suspension eye when you want to install the unit against a wall. Since it has a wide bottom, it remains stable when placed on a flat surface. It is only 1-inch high, so you’ll be able to move it from room to room. Humidity monitors could not have come at a better time when we need them to assess the quality of our indoor space environment. Before you take home a device, it’s important that you have some hands-on information to help you make a good choice. Prevent Growth of Bacteria and Mold. When you have a humidity monitor, you’ll prevent the growth of mold and bacteria as they need lots of water to thrive. Mold are eye irritants while bacteria cause illnesses, a monitor helps to know the humidity levels so that you can activate a dehumidifier to rid off the excess moisture. Prevent Structural Damage. Moisture buildup can cause damage to furniture and walls. It is usually exhibited as wood rot, damp spots, corroded furniture, and paint peeling off. These situations can be avoided when you have a monitor to help activate indoor systems to control humidity. Saves you money. Applying a humidity and temperature monitor in your home will save you money on health and repair bills. It also protects you from wasted stock, bad harvests, and product recalls. User-friendly. Indoor humidity monitors are simple tools that use sensors to display data. They come calibrated, so all you need to do is read and make the right changes to indoor instruments and equipment. They can’t change the humidity levels. All the device does is indicating the percentage of relative humidity. It will not help to regulate the humidity to a better level. You’ll have to pair the device with a humidifier or dehumidifier. Time, Date, and Alarm Settings. If you would like the hygrometer to display the highs and lows after a set time, a device with an alarm helps to make that happen. The alarm also works for basic ringing to wake you up while the date settings display the daily calendar and even remembers the day and time when it is powered off. What are you likely to see on a monitor when the humidity is 100 %? When humidity hits 100%, it means the air is completely saturated. You will see a WET level on the monitor since any more cooling to the ambient air, and water droplets in the form of dew, mist or fog will be released to the ground. What is the Most Comfortable Level of Humidity? Every household produces moisture from exercising, bathing, cooking, washing and many others. Too high or too low humidity is not healthy. A normal humidity that is comfortable for most people is 25-40% in winter and less than 60% in summer according to the US EPA. Leaky Windows. When using single pane windows, excess moisture is likely to get into your home. You will notice this by mold growing around the windows. Poor Ventilation. If you live in environments where the air outside is relatively humid like in Houston, moisture can build up in the home leaving you in an uncomfortable environment. Heat and moisture can get trapped if there’s no means of escaping through vents and windows. Excessive water use. Running the shower or dishwasher for extended periods, cooking and other applications of water can increase humidity levels tremendously. A baby’s room. A humidity monitor for the baby’s nursery helps to control the spread of flu and viruses and growth of mold in the room. A monitor helps to know when the levels are ideal between 30-50% according to Mayo Clinic. Weed Growth. Indoor humidity for cannabis plants has to be optimal at their various levels of growth for healthy plants and good harvests. Too much moisture can lead to the growth of mildew, bud rot, and mold. Clones need a humidity of 70%-80%; the vegetative stage needs 40%-60%, flowering needs 40%-50%, while final weeks of flowering need less than 40%. Grow Rooms. Indoor gardens are affected by temperature and humidity. Farmers need to monitor humidity readings using a hygrometer to help identify the course of action. This can be to either increase the ventilation or use a humidifier to increase the humidity levels. Music Instruments Room. A safe level of humidity is required for high-quality solid wood guitars since wood is not replaceable in a guitar and even in a piano. An ideal relative humidity level has to be controlled at around 50%. If you are a guitar retailer, you’ll want a device for your instruments if you wish to maintain the intended quality of the manufacturer. Swelling and shrinking of piano soundboards affect tuning, that’s why relative humidity should be controlled at around 42%. Reptiles. Cool temperatures are just as important as proper humidity for reptiles and other amphibians. Humidity monitors will help you control their conditions. As a reptile owner, it’s vital that you know the ideal relative humidity for the kind of reptiles you keep. You can always consult with a local reptile’s expert if you have no idea about your particular pet. Wood Room/Shop. Climate control is a must for wood storage and shops where you are selling wooden furniture like tables, chairs, bed frames, dressers, etc. Too much moisture causes wood to warp, rot, and crack over time. A humidity monitor will help sellers keep such storage spaces in optimum conditions. Wine Cellars. Ideally, wine is stored in underground cellars in a corked glass bottle. Winemakers have to monitor the humidity level to create the ideal cool and damp environment for wine aging. The cork used to seal the glass bottle is natural in that it is affected by current humidity levels. Low humidity dries out the cork which leads to too much air entering into the bottle while too much moisture causes the cork to swell and sealing the glass entirely while encouraging the growth of mold. Water Activities. Indoor swimming pools and saunas release lots of evaporated water into the atmosphere. Since there’s no way to control evaporation, humidity monitors are paired with dehumidifiers to restore ideal relative humidity to prevent the destruction of walls and buildings. How can you test the accuracy of a humidity monitor? You can’t always accept results on a monitor because they look reasonable. Here’s how to test for accuracy in a humidity sensor. The saturated salt method is mostly used as it produces standard results. Hygrometers and humidity sensors are used interchangeably to mean the same thing. These are instruments that measure the relative humidity of indoor environments. But these words should not be confused with a humidistat which is used to actually control humidity. Humidity monitors for Android are mobile applications that help users get up-to-date readings of humidity around them by monitoring mobile device sensors and current environment parameters. They help the user know when to use a humidifier or a humidifier. An indoor humidity monitor has humidity sensors that help the device to display correct readings in real time. They are more popular than Android Apps because of their high accuracy levels. We cannot underestimate the importance of a good indoor humidity monitor. If you have concerns about levels of humidity in your home, recreational area, storage facility and the like, then you’ll want to invest in one of these top-rated brands. We hope you can improve your current living conditions by employing a humidity monitor with the right procedures to correct poor humidity status. Go on and start living a better life. I bought AcuRite 00613 and Adoric Life Indoor Humidity and Temperature Thermometer. i got confused when i saw the reading of AcuRite 00613 is ten percent higher than Adoric Life Indoor Humidity and Temperature Thermometer (for humidity). After many test, i found that AcuRite 00613 didn’t work accurately for measuring the humidity level.